Like a sheriff who knows she is the boss, Alana Shock stands in one of the rooms at her restaurant. Shock is the owner of Alana's Food & Wine at 2333 North High Street which is located North of the Ohio State University campus area and South of Clintonville on the West side of High Street. There is a big patio outside but unfortunately the weather didn't allow us to photograph there. 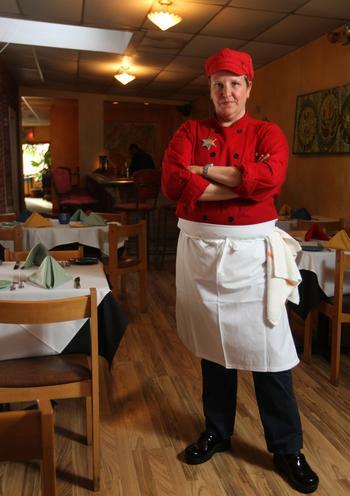 I photographed Alana Shock for Columbus Business First for a story on woman restaurant owners in Columbus. You can find the story in the April 1 issue or checkj for it on their website. Shock opened Alana's Food & Wine 12 years ago, and she told me she wears the sheriff's badge every day. I cannot believe I have lived in Columbus for 15 years and had never been told about the restaurant before. I'm going to try and get down there soon though. I do recommend the restaurant just from the smell of the food and great staff. Everyone was easy going as they dogdged around me. Along with the smell of the food, the three distinctly different dining rooms hold some visual treasures as well as exuding an inviting ambience for guests to relax, share a glass of wine and enjoy a wonderful meal.